A brain vain thinker is one who is suffering from opinion pride. This PTV-infected brainuser is unable to see a better way of looking at things. Because the brain vain thinker is so proud of her or his own opinion, they find it difficult to do any other kind of thinking but to defend it. The more intelligent the brain vain thinker, the more they may suffer from this kind of cognitive conceit. Very bright thinkers who are PTV-infected may be only using their brainpower to defend their opinion. They are unable to escape from their viewpoint to look for a much better one. The righteous brain is blind to real world consequences. PTV may have so incapacitated a True Believer that he is unable to see the results of his actions. In the belief that they are ‘morally right’, any action is justified by the Righteous and Sightless, regardless of what follows. This is a very dangerous condition and so often fatal. Millions have rushed headlong into death because ‘God is on our side’. Millions have been killed because they are ‘infidels’, ‘Jews’, ‘Catholics’ or ‘Protestants’, ‘Sunni’ or ‘Shia’. The ‘I-am-right-and-you-are-wrong’ mindset the hallmark of the Righteous and Sightless condition. In 1994, John Paul II urged all Roman Catholic Cardinals to reflect on this dark aspect of the Church’s history: ‘How can one remain silent about the many forms of violence perpetrated in the name of the faith – wars of religion, tribunals of the Inquisition and other forms of violations of the rights of persons’. In a meeting, the space glutton always takes up considerably more than his or her fair share of space or airtime. Space gluttons may suffer from output mania, the inability to shut-up. Gathering input by listening to the opinions of others is an important cognitive skill which is crippled in the greedy space glutton. PTV may allow the thinker to wreak such enthusiasm for his or her own ideas that he or she is quite unable to listen to others. 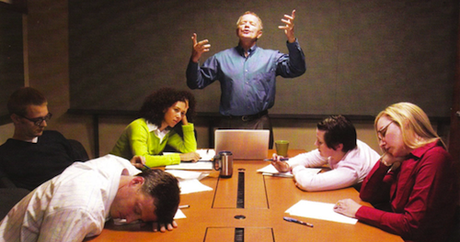 In business, much creativity and productivity is lost in meetings due to those suffering from this condition. This condition is disastrous for those in sales, management, teaching or any position of leadership. Lazy critics suffer from mistake-phobia, the morbid fear of ever making a mistake. The PTV-infected brain has an aversion to ever being wrong. It comes from our medieval habit of looking at the world through the pre-Enlightenment concept of ‘right’ and ‘wrong’ (not shared as much by other cultures like the Chinese who are often post-Enlightenment thinkers). When a sovereign thinker is about to try something new, he never really knows what will happen. There is always risk and uncertainty. This risk is enough to keep the mistake-phobiac hiding in inertia. As an effective disguise, the mistake-phobiac often assumes the role of ‘the critic’. Taking pot-shots from the relative safety of his or her bunker of reluctance, the lazy critic simply waits for another thinker to make a mistake and then the whingeing and whining begins.